A photographic safari, starting and finishing in Minneapolis, MN and focused on the Montana Rail Link, taking in the Badlands of North Dakota, the Yellowstone, Clark Fork, Flathead and Missouri Rivers and the Bozeman and Mullan Passes through the mountains of the American West. The MRL is a regional railroad which leased the former NP mainline through the Rockies from BNSF in 1987. It runs from Huntley MT through Billings, Helena and Missoula to Sandpoint in Idaho although it has trackage rights into Spokane, WA. Total mileage operated is about 1000. In the course of eight days Mel Finzer and I drove some 3500 miles in pursuit of trains, through some of the most spectacular scenery the USA has to offer. 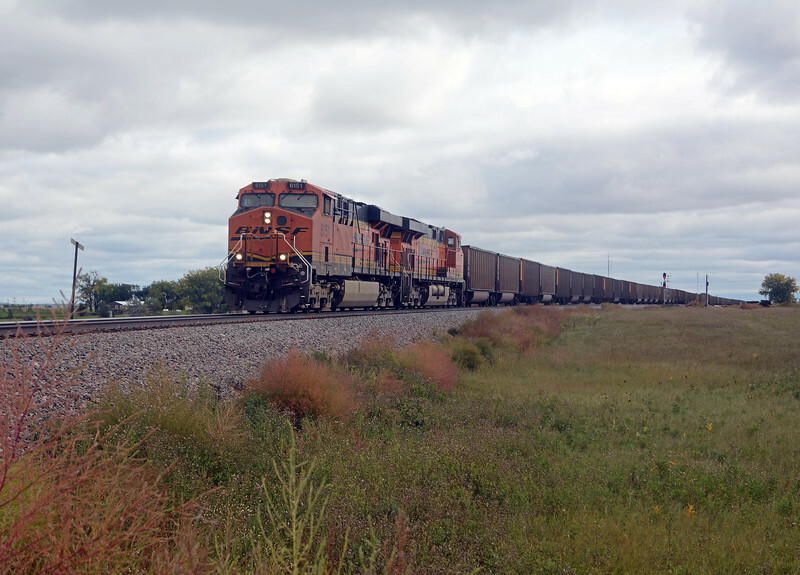 We saw 120+ car coal trains, oil trains of Dakota crude, solid trains carrying grain for export, mainline merchandise freights and local switching turns, the latter with MRL power, whilst the through trains invariably retained their BNSF locomotives. Apart from the two Mondays the weather was generally pretty good, warm by day with plenty of sunshine, and remarkably warm at night too. Starting from Alexandria, MN where we spent our first night, we drove NW then West along Interstate 94, pausing for a first picture at Menoken, ND. We had been driving for almost four hours, through misty, sometimes damp conditions before, around lunchtime, the weather started to improve. This westbound (WB) empty coal working was presumably returning to the Powder River Basin in Wyoming for another load. 6151 is a GE ES44AC (Evolution Series, 4400 hp, AC traction motors). We'll see plenty more of them before the week's out.